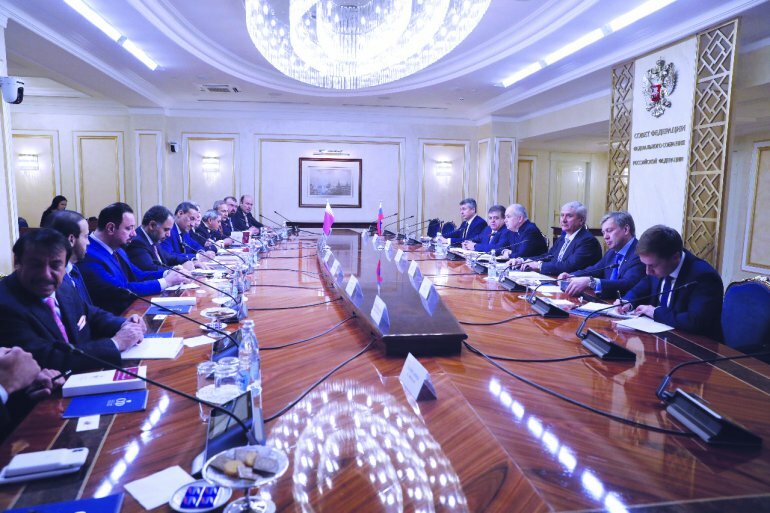 The Qatar-Russian Business Council organized a meeting in Moscow and discussed ways to strengthening and expanding bilateral cooperation between businessmen from both countries. The Qatari side was headed by the Qatar Chamber’s Board Member Ali Abdullatif Al Misnad, whereas the Russian side was headed by Ahmed Blancoev. The meeting also witnessed the signing of an MoU between both sides to strengthen their cooperation and bilateral relations. The meeting was attended by Khalid Ahmed Al Mannai, Dr. Ahmed Al Sulaiti, Yousuf Behzad Yousif, Nasser Ahmed Al Khalaf, Mohammed Hussain Fikri, Abdulla Rafie Al Emadi, Antonio Roqueim Netto and Assistant Director-General for Government Relations and Committee Affairs Ali Bu Sherbak Al Mansouri. The meeting was also attended by the Ambassador of Qatar to Moscow Fahd bin Mohammed Al Attiyah. The meeting touched on reviewing bilateral relations of both countries and ways of enhancing them, especially in trade and investment aspects. It also reviewed the investment climate in both countries and business opportunities available for both sides. During the meeting, the Qatari delegation informed the Russian businessmen on Qatar Chamber’s activities and roles in the private sector including facilitating business community and attracting foreign investments. In a joint statement, both parties underscored the importance of the council in streamlining communication between business sectors of both countries and in removing any obstacles that might face their joint investment and cooperation. Both sides also assured their participation in St Petersburg International Economic Forum 2019 and meetings of the joint commission to be held on the sidelines of the Forum. They called the Russian private sector companies to organize industrial and commercial exhibitions in Qatar. The Qatari delegation called for establishing an electronic database for the council to include all trusted companies as well as laws and rules of both countries, while the Russian part assured to provide the Qatari side with all data about investment incentives offered by the Russian government and all regions for investors. On the sidelines of the meeting, the Chamber’s delegation held a meeting with the Chamber of Commerce of the Russian Federation. The meeting discussed ways of promoting cooperation and economic ties between both sides.